When a developer publishes an app in the App Store, they’re given the ability to use 100 characters of keywords to try to maximize their search ranking. This is way more important than most people realize. There are probably 150-200 different apps for something as simple a “Mortgage Calculator”, yet the 5 apps that show up above the fold (i.e. what you can see with out scrolling down) probably get well over 85-90% of all of the downloads (much like on Google). That’s because those developers optimized. It’s important to constantly be changing your keywords, learning what combinations drive the most traffic, and then sticking with that. Often times it can take months of trial and error until you get the most effective set of keywords. But trust me, its worth it. Do not be foolish or ignorant enough to think that the only “app market” that matters is in the US. That is quite a dangerous assumption, and in fact based on current trends it won’t be long before China surpassed the US in terms of money being spent! Not only is the Chinese market growing (financially) at a scary fast pace, new carriers are starting to distribute the iPhone (meaning that nearly 216 million new subscribers will now have access to the apps you build). Think what happened in the US when Verizon started offering the iPhone – but much bigger. Have you ever been in an app and had a push notification come up that says “Download XYZ App for FREE from our friends at ____ Studios”? 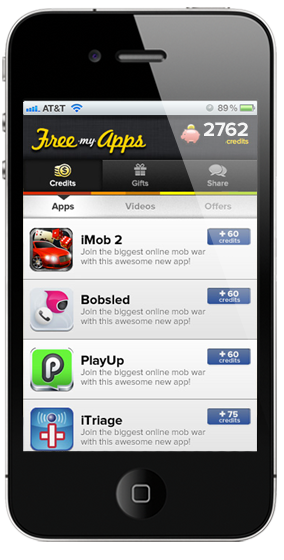 If you download that app for FREE – the app developers that first showed you that app probably just got paid $0.60. In fact, this idea that developers will pay for free download has spurred amazing sites like Free App a Day and Free my Apps which allow you to use paid apps for free by simply trying out other apps. Companies like Blue Trumpet actually make a living off of this. Of the top 200 highest grossing apps in the App Store (i.e. the 200 apps who have cumulatively made the most money), 50% of them are freemium apps (i.e. were free to download and found other ways to monetize). Even crazier, in the Android Market 65% of the top 200 apps are freemium! The craziest part is that studies have started to show that users who download an app for free are likely to spend more than $0.99 over the lifetime of that app, while users who pay $0.99 feel entitled (because they paid), and are borderline insulted if you ask them to pay more. You are starting to see a trend, more and more full-blown websites all about mobile. You are also starting to see different 3rd party app stores pop up all over the place. One example being CNET: which will allow you to download tons of mobile app files to your computer. This way you can put it on your SD card and run the application on your phone. Right now all carriers do not allow this (as it circumvents their system a bit), but I think you will see a trend toward being able to download mobile apps anywhere and everywhere. Why not right? Distribution is everything. App prices change all of the time. In the lifetime of an app you can often see it sold for as much as $10, or as cheap as free. As a consumer of apps its important to keep tabs on some of those expensive apps you want as more often than not they will run a promotion and you can get in cheaper. But from the development standpoint its really important to note that price / demand elasticity is a very crucial part of succeeding in any app marketplace. Oftentimes developers assume their app has to be $0.99 or free, even though competitors and similar apps with similar rankings are actually selling for $1 or even $2 more! It’s also important to do “free for a day” promotions every once in a while. In the past I have seen developers get anywhere from 50,000 to 80,000 users in ONE DAY, just by temporarily flipping on the free switch. These users will create consistent usage that can absolutely be monetized. I realized something pretty funny recently. The “Featured” apps on Apple, and the “New and Noteworthy” apps are more often than not actually that new! In fact, if you talk to someone who has been featured by Apple you will quickly realize that they tend to get featured 2 or even 3 times. Once an app is on Apple’s team’s radar it stays on there. Sometimes even something as simple as pushing out a new update or bug fix will spark being featured or “New and Noteworthy” again! Morale of the story? Update your apps regularly! Jonathan Kay is the founder of Apptopia – a marketplace to broker the sale (acquisition) of mobile apps (think in terms of ownership, code, users, etc). Jonathan is passionate about creating both an exit strategy for mobile app developers as well as an opportunity for business minded entrepreneurs to get involved in the mobile industry.